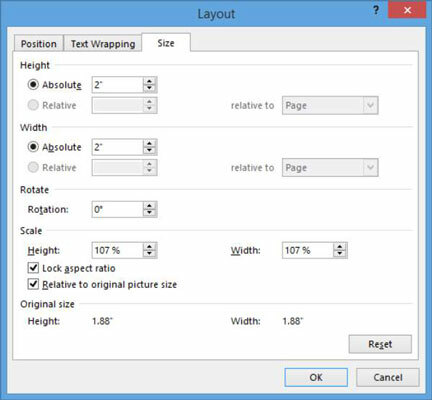 In Word 2013, you can resize a picture by dragging its selection handles or by specifying an exact height and width for the picture from the Layout dialog box. When you resize a picture, its aspect ratio can change. The aspect ratio is the proportion of width to height. A photo may not look right if you don’t maintain the aspect ratio; clip art is less likely to suffer from small differences in the ratio. When you drag a corner selection handle, the aspect ratio is maintained; when you drag a side selection handle, it is not. Most image types maintain the aspect ratio automatically if you drag a corner selection handle. If the aspect ratio doesn’t stay constant when you drag a corner selection handle, hold down Shift as you drag to force it to do so. Raster images look fuzzy if you enlarge them past their original size. That’s one advantage of vector images: They remain crisp and sharp at any size. 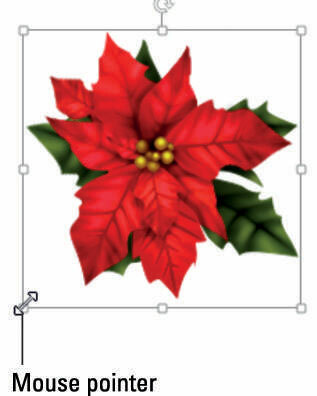 In a Word 2013 document with clip art or a picture, select the clip art image. Hover the mouse pointer over the lower-left selection handle. The mouse pointer becomes a double-headed diagonal arrow. Drag out and downward, enlarging the image by about 1/2 inch. Use the onscreen ruler to gauge the distance. If the ruler does not appear, mark the Ruler check box on the View tab. Right-click the picture and choose Size and Position. The Layout dialog box opens with the Size tab displayed. In the Height section, set the Absolute setting to 2″. The Width automatically changes because the aspect ratio is locked. Depending on the image you are working with, the width may not be the same as the height. Save the changes to the document and close it.